Are intensity training workouts harming your health? 'Iron Master' Arthur Saxon exposes the dangers you must avoid. In the course of your training you will undergo a transformation, not only in your strength, but also in your physical development. This is a natural and welcome part of the muscle building process, because as surely as you learn to lift more iron you will also build muscle. Yet while such feats should be applauded, there is often a danger skulking in the shadows. For as you endeavor to squeeze the last fraction of an inch from your muscular development, these actions sometimes carry a painful cost. And the victim in all of this? While the wise trainee places a premium upon the possession of untiring energy, superhuman stamina and peerless power, these qualities can take a back-seat during training. Instead of building strength and power and focussing 100% on adding more iron to your bar, the trainee misguidedly places a premium on muscular development. The trainee leaps from one training style to another; adds more exercises; begins to overtrain...simply, health is sacrificed for vanity. So how can you halt harming your health? With regard to the routine of intensity training workouts, you should avoid developing muscle at the expense of strength or health. 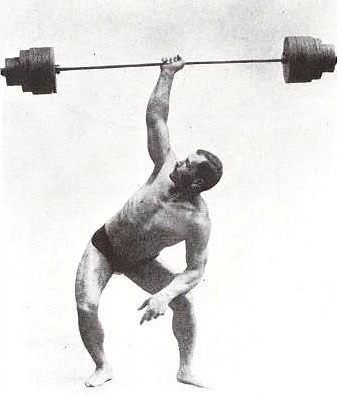 This practical training philosophy was championed by strongman and 'Iron Master' Arthur Saxon over one-hundred years ago. He would write: "Judge a man by his capabilities as an athlete, whether a weight-lifter, wrestler or not, and not by the measurements of his biceps or chest." Saxon believed a man should train for power and strength first and "leave the muscles to look after themselves". He saw no gain in growing artificially-swollen muscles to gratify a vain desire for personal glorification. His goal was to instill genuine power without any attempt to obtain larger increases in the dimensions of the different muscles. Remaining true to his ideals, Saxon would craft a powerhouse physique and become 'The World's Strongest Man' and earn the monicker the Iron Master. Here is what happens when you train for strength. Calf . . . . . 16 inches. One-Hand Clean and Jerk . . . . . 247 pounds. Arthur Saxon's strength first, size later protocol would build a fit, strong and muscular body - three keystones to vibrant health. Can the 'Iron Master' do the same for you?